Well, finally it stopped raining and this morning I hit the beach early. I didn't find any Franklin's Gulls but there is always something interesting to look at. 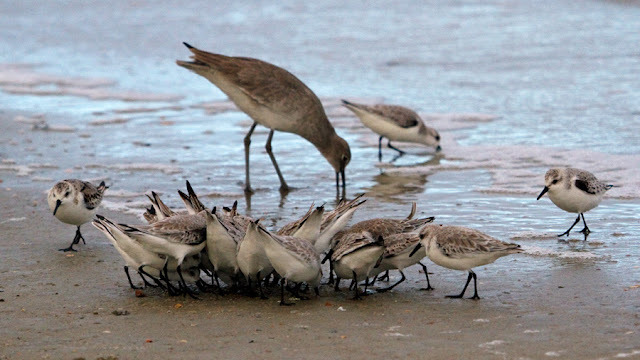 This morning the Sanderlings, Willets, and Ruddy Turnstone were frantically feeding on something - perhaps a horseshoe crab nest? Skies were overcast early but still fun to see this behavior. What's for Breakfast? Willet and Sanderlings are chowing down! 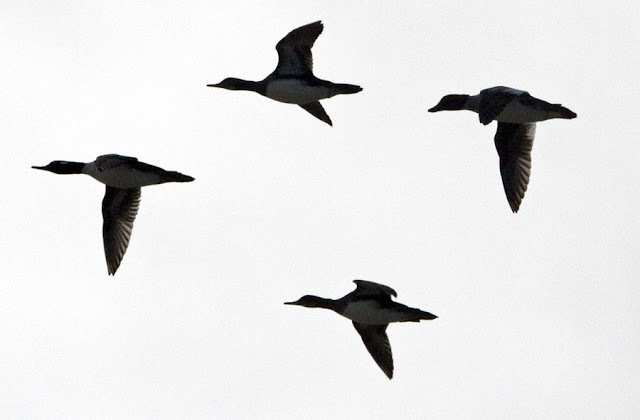 Steve Calver showed up and we were studying the birds when four ducks flew over - flapping fast! I put the camera up and got off a couple of shots. My first thought was Hooded Mergansers. 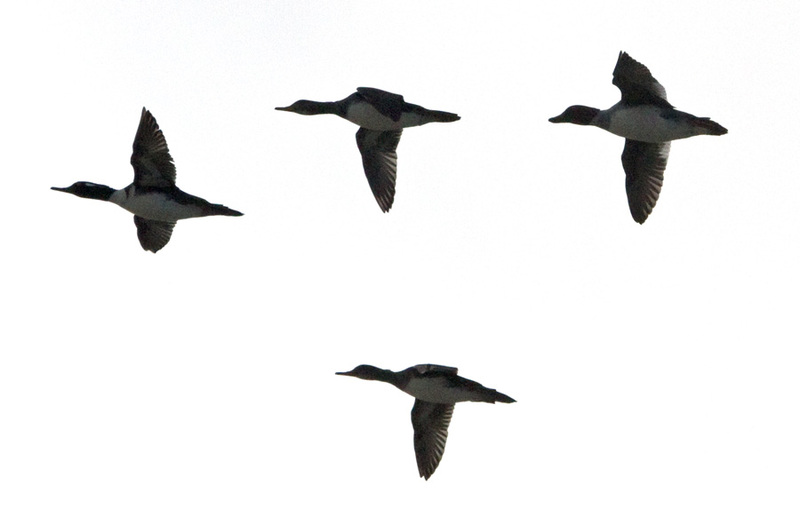 When I looked at the photos, there were three mergansers and one different duck with a rounded bill. Steve's first thought was Black Scoter but on inspecting the photos, I noticed that there wasn't any light color on the face, the belly was light, and there seemed to be white patches on the trailing edge of the wings. What do you think? Female bufflehead? Female common golden-eye? After lunch, Brenda Brannen, Sandy Beasley and I went to Fort Pulaski looking for Brown Creepers and Sedge Wrens and anything else we could find. In the pine grove at the picnic area things were hopping with Eastern Bluebirds, Brown-headed Nuthatches, Pine Warblers, sapsuckers and more. We kept hearing a high-pitched call and finally found a couple of Golden-crowned Kinglets actively feeding in the pines. 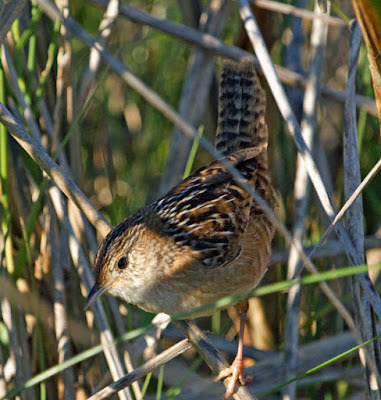 When we went over to the field behind the Fort to look for sedge wrens, we spied a brown bird walking in the grass. 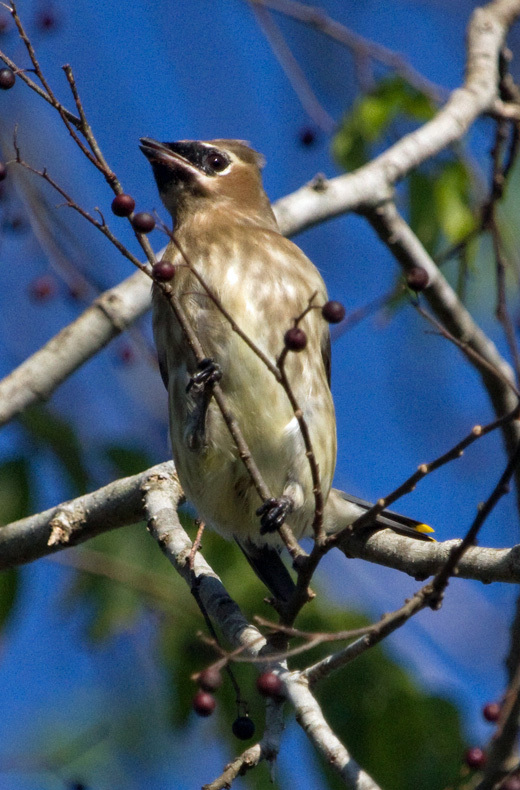 Our first thought was Eastern Meadowlark. 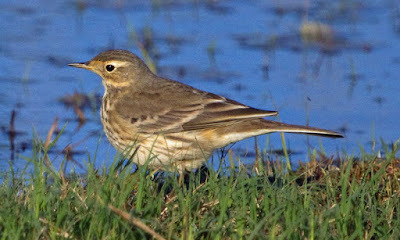 However, when we got closer, it turned out to be an American Pipit! Unlike the meadowlarks, it allowed me to walk close for photos! 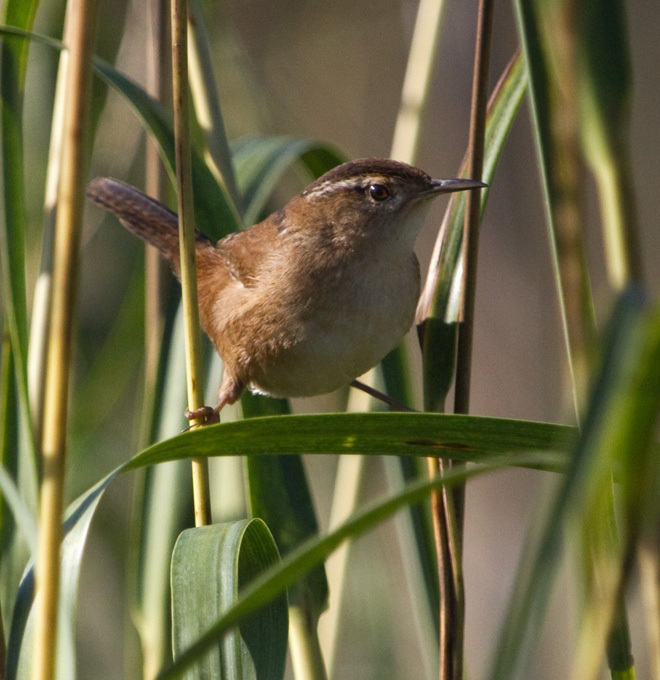 Standing on the dike, we could hear at least two Sedge Wrens calling but they were being very elusive. Next, we had a long walk with few birds. Sandy and Brenda left but I kept birding, continuing on the path behind the Visitor's Center. At the end of the path, I started pishing in the wet area where I had previously found Sedge Wrens. This time, the wren that popped up was a Marsh Wren. 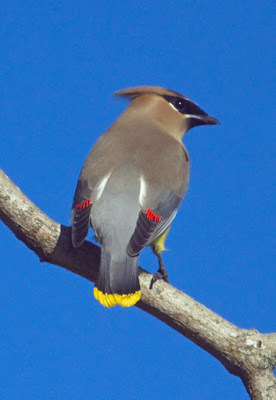 Walking back along the path, I glanced up and saw a small flock of Cedar Waxwings - my first of the season. 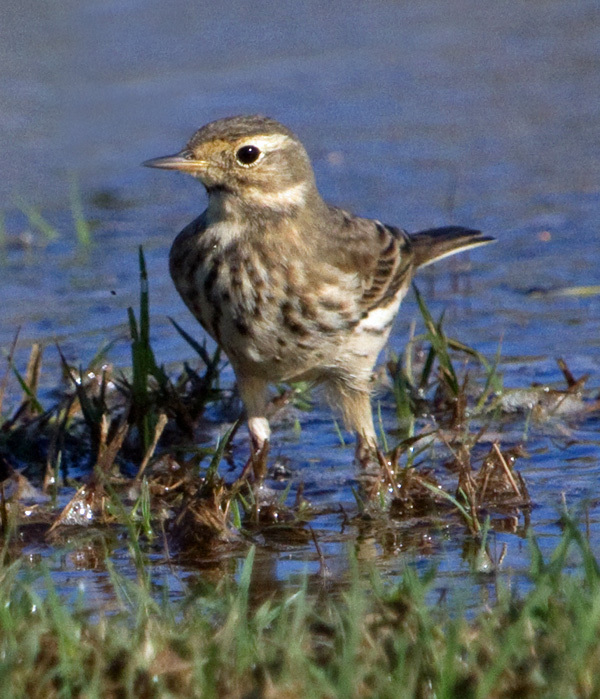 It was fun to see a streaky juvenile in with the group. They were dropping down into a yaupon holly that was loaded with berries. 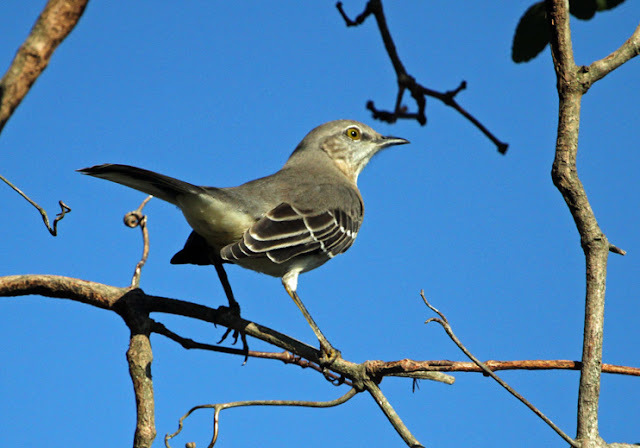 Of course, the local mockingbird did not want any other bird messing with its berries! Next, I made one more long walk back out to Sedge Wren territory. 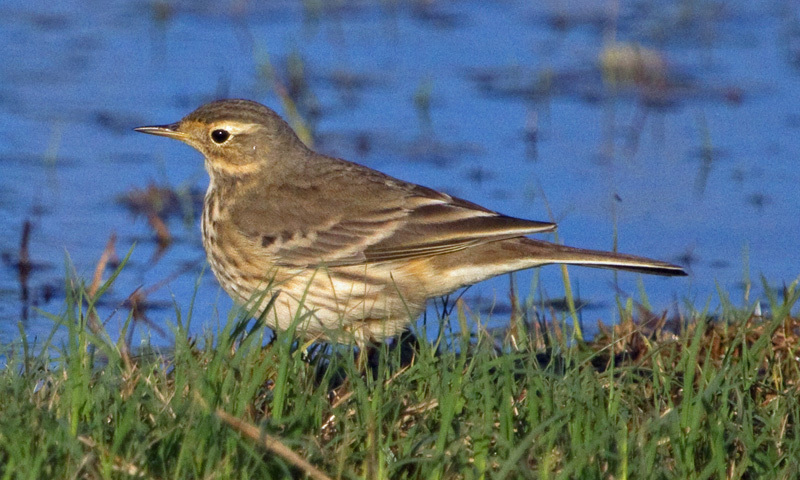 I flushed a Wilson's Snipe, and the American Pipit was still where we had left it. 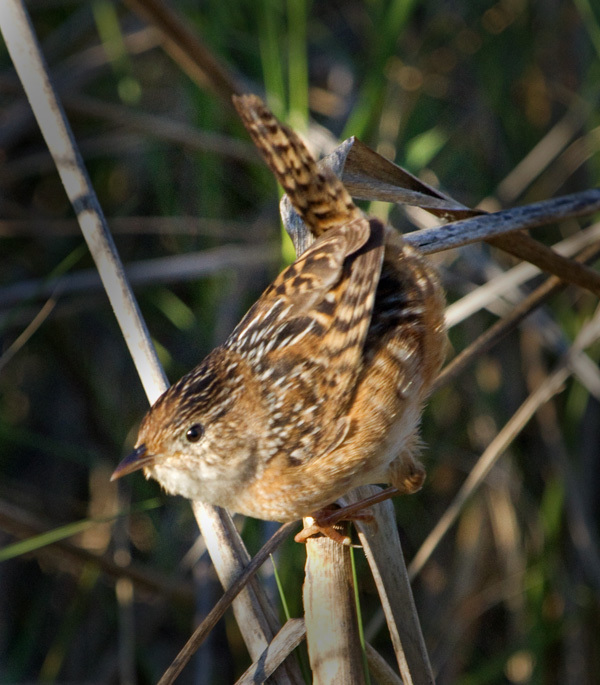 This time, the Sedge Wren responded to pishing and to its call, coming out to pose for photos! All in all, it was a fine day of birding! Great to have sunshine after two days of rain.